After years of probing, posturing and prognosticating the telecoms industry has committed to the first 5G New Radio standard. At Mobile World Congress earlier this year the decision was unilaterally made, with some dissent, to fork the development of 5G NR into standalone and non-standalone versions. The apparent need for this fork was so that we could get on with the air interface part without having to wait for the core and all the attendant mind-boggling complexity to be finalised. As a consequence, while much of the 5G core will have to wait until the middle of next year to reach its first standard ‘freeze’ (i.e. the work done so far is set in stone), we have been able to freeze the first standard for just the air interface component of 5G. Because this will still rely on the legacy 4G core it is referred to as non-standalone (NSA – not to be confused with the National Security Agency, or indeed No Strings Attached). To get a better sense of the significance of this we spoke to Ulises Olvera-Hernandez of InterDigital, who is an active participant in the system architecture group of the 3GPP and has generally been elbows-deep in the 5G standardisation process from the start. “This is a very significant drop for the 5G specification,” he said. As has been extensively covered, 5G is about a lot more than just more 4G – i.e. improved data rates. The world also wants 5G to enable massive IoT with technology that combines very low energy use with limitless scalability. And as if that’s not enough we also need 5G to offer the kind of robustness, efficiency and flexibility that will allow utopian use-cases such as autonomous vehicles and robotic surgery. “This release includes something that is referred to as ‘ultra-reliable, low latency communications’,” said Olvera-Hernandez. “In simple terms this requires a new radio interface that is able to respond much quicker.” He also said the whole IoT aspect has not been covered in this release but will be addressed subsequently. One other significance of this milestone is how it positions the 3GPP in the overall 5G standard mix. 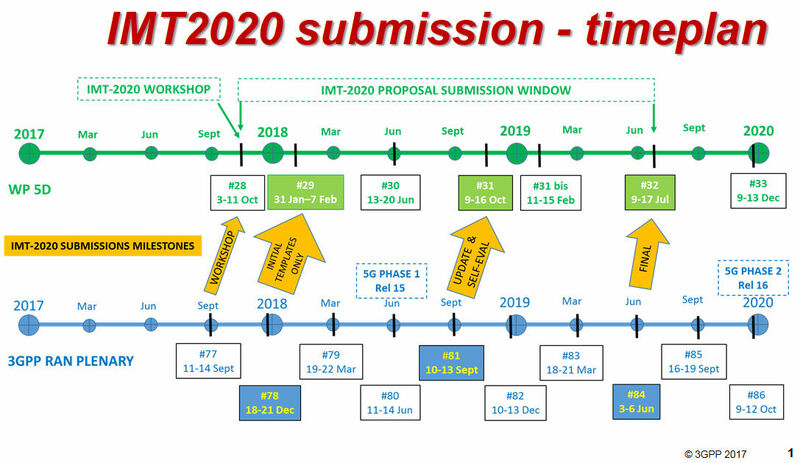 This stuff is ultimately adjudicated by the ITU (International Telecommunications Union) via its IMT2020 group and the deadline is looming. You can see the submission timeline below. But the most immediate and conspicuous consequence of freezing the 5G RAN standard will be the legitimization of the use of 5G by the marketing teams of any company even remotely associated with the telecoms world. They hardly need encouraging, of course, but the 5G spam we have had to endure to date will pale into insignificance compared with the deluge to come. “Companies will now be able to say they have a 5G radio interface and that their core network is ‘5G ready’,” said Olvera-Hernandez. 5G ready. The phrase alone is enough to make those of us who earn a living by spending an unhealthy about of time banging on about phone stuff shudder in grim anticipation. We will probably see the first 5G ready claims as soon as everyone has got over their New Year hangovers but, more surprisingly, we might even see actual commercial products to back that claim up before the end of the year. The decision to go with NSA first seems pretty sensible on one level, but while it has sped up the process by which various telecoms industry stakeholders can legitimately claim to have 5G products and services, it also creates a separate set of complexities. The marketing frenzy is inevitable but it does risk setting unrealistic expectations, which will be exacerbated if the process of reconciling NSA with SA doesn’t go smoothly. If all this has merely served to whet your appetite for telecoms technicalities you can have yourself a very geeky Christmas by reading this 3GPP brief introduction (!) 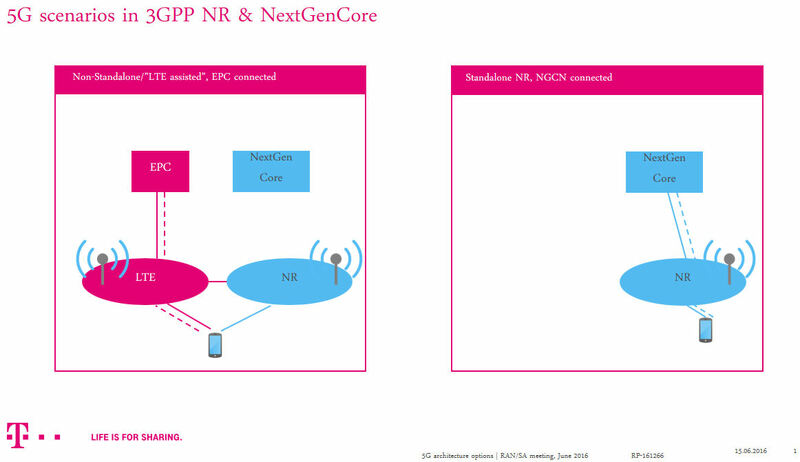 to the 5G system architecture. 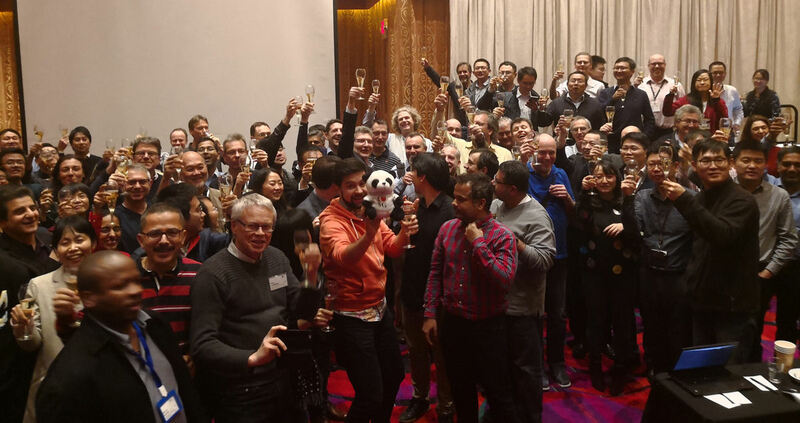 On a lighter note we’ll leave you with this photo of the 3GPP architecture working group on the lash, having hit their milestone.